Not only the Dutch and Russians are dominating in the Trucks: Next to the Buggyra team and the this year not so lucky Ales Loprais, the Czech Republic has many truckteams - like the yellow Liaz of Martin Macik and his crew. In SS04 the crew finished as 6th in the daily rankings and reached the 4th position overall. "We have not experienced such a terror for a long time. The organizers made it really hard. 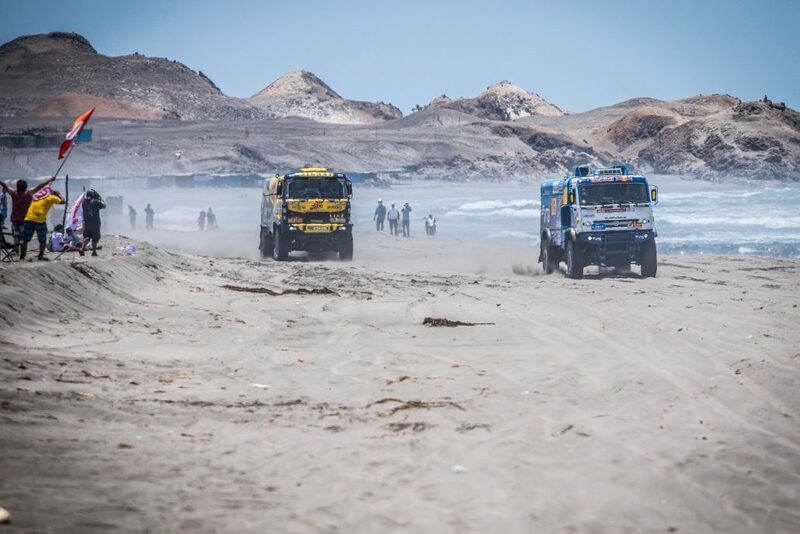 But that's what Dakar should look like," said driver and Teamchef Martin Macik. "Navigation is complicated, cars get busy, we find ourselves in risky situations. It was not pleasant at some times. Sometimes like a minefield, not easy to handle." The yellow Liaz number 510 met other teams desperately struggling with sand, technics and themselves. It was challenging to find control points and to figure out how to fight them. "At one point, the road was blocked by Kamaz, who was recovered from a dune. We needed to pass them, went through a sandy funnel, where we got problems with the brakes," navigator Frantisek Tomasek said. But it was not the last damage for their racing machine, the team had to stop some times more before the finish line. "However, the mechanics had a lot to do in the evening."